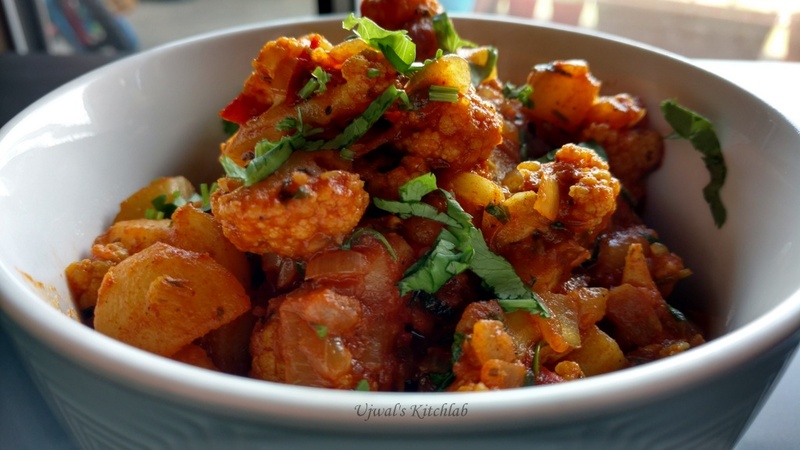 Aloo Gobi is one of my favorite side dish with soft phulkas. As all of us love it so I make this often but the only issue that I used to face was one of the vegetable would turn soft or soggy which is a total disaster in this recipe. Over the years I learnt from my mistakes and now this recipe is perfect for us. The veggies are cooked but yet they hold the shape and flavors! It is slightly time consuming but the end result is so worth it. Try it and I am sure you will fall in love with this. 1) Soak cauliflower florets in water with salt and turmeric powder for few mins.Drain. This ensures that the florets are clean and free of worms. 2) Heat 2 tbsp oil in a kadai and add the cauliflower florets. Saute on low flame with little salt until they are slightly cooked yet firm. Drain. In the same oil add the Potato cubes and saute on low flame with salt until nicely browned. Keep aside. 3) In the same kadai add some more oil. Add cumin seeds and let them splutter. Add ginger garlic paste and onions. Saute until onions turn pink. Add tomato puree and cook till the rawness goes away. 4) Let the flame be on low and add in the masala powders one by one. Take care not to burn the spices. Toss in the shallow fried potato and cauliflower. Mix gently until the veggies are nicely coated with the gravy. Add salt and sugar (if using). Cover and let it cook slightly in steam. Avoid over cooking as it makes the curry mushy. 5) Crush the kasuri methi in between your palms. Let it cook further for 2-3 mins to infuse the flavors and switch off. Garmish with chopped coriander leaves. Serve hot with soft phulka's or with some steaming Dal and Rice.